Do you know that Lake Michigan has sand dunes? Or that Northern Michigan, with its rolling hills and sandy, dry soil is the perfect place to grow sweet and tart cherries? And do you know that there’s such a thing as a state mineral, rock, stone, or gemstone? 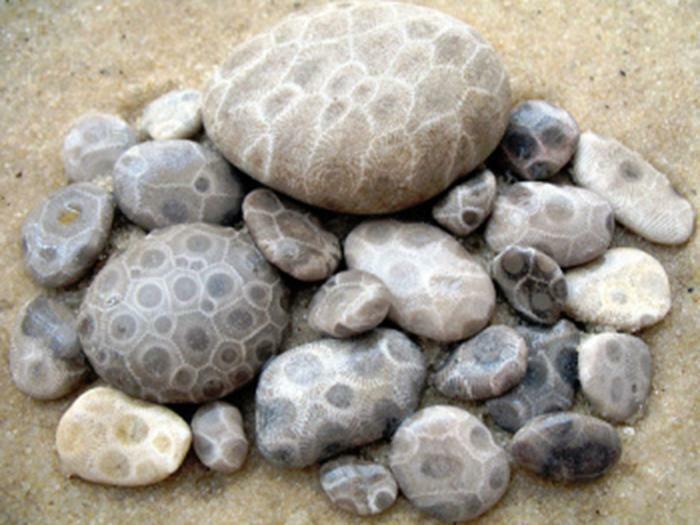 In Michigan, the Petoskey Stone, a prehistoric fossil, is Michigan’s official state stone. These are just some of the facts I learned on a visit to Traverse City, Michigan. There’s plenty to do in Traverse City year-round with wineries, an appealing pedestrian-friendly downtown, and quality restaurants. You’ll find all types of skiing, snowmobiling, and snowshoeing in winter, beautiful foliage in the fall, and the cherry tree blossoms in spring. But it’s the summer season that provides one-of-a-kind offerings. In fact, Traverse City is known as the Cherry Capital of the world and you’ll find not only the best cherry pie, but miles of sugar-sand beaches and countless outdoor activities to make any summer vacation memorable. Over the summer months, u-pick farms and farmers’ markets are jam-packed with cherries. If you are used to the expensive bags of cherries at the supermarket, you will surely enjoy snacking from brimming baskets of sweet cherries. An annual National Cherry Festival, held this year between July 1 to July 8, celebrates all things cherry plus foodie events, free family fun, races and health activities, concerts, parades, and more. There are peninsulas and miles of coastline, trails to walk and bike, a variety of water and boating activities, charming towns, and vintage lighthouses. Attend an open-air performance by students of the Interlochen Arts Camp, as well as international stars. The camp attracts musicians, dancers, actors, and artists. Former graduates include Josh Groban, Jessye Norman, Peter Yarrow, Lorin Maazel, Jewel, and Linda Hunt. Reserve your tickets early. You could spend days exploring this National Park’s forests, beaches, dune formations, and ancient glacial phenomena. If you have less time, the National Park Service recommends you take the 7-mile Pierce Stocking Scenic Drive, trek up the Dune Climb or watch others walk up and run down the towering sand dunes, explore Glen Haven and the Maritime Museum, and dip your toes in the tranquil Loon Lake. More time? Walk or bike the Sleeping Bear Heritage Trail and attend a ranger-led program. For more information, visit this site here. A complex of restaurants, wineries, breweries, shops, boutiques, and galleries redeveloped from what was once a 19th century state mental asylum, located just a few blocks from downtown Traverse City. Historic, photography, and twilight tours are available by reservation in the castle-like buildings of the former asylum. There are a multitude of ways to enjoy the deep glacial Torch Lake, Elk Lake, and Lake Leelanau, or the calm waters of the two arms of Grand Traverse Bay. Options include boat or kayak rentals, parasailing, or diverse boat tours. Per the Petoskey Regional Chamber of Commerce, the best place to hunt for Petoskey Stones is at Lake Michigan beach. They’re also found in roadbeds, gravel pits, and even farmers' fields. Or, go the easy way and buy one in a souvenir or gift shop. For additional information visit Traverse City's attractions site here.